Let’s face it, the Quarks were not exactly terrifying. 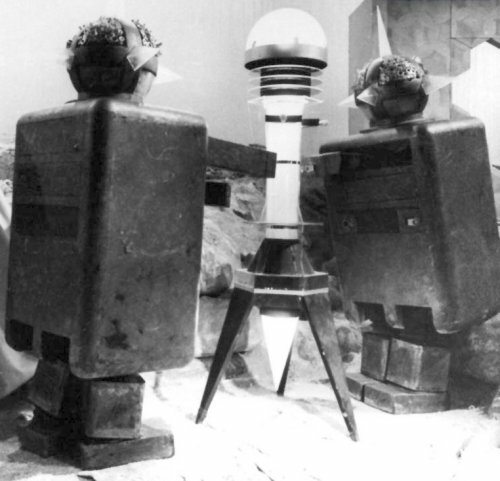 Robotic drones in service to the humanoid Dominators, the Quarks were boxy constructions with fold-out arms, stumpy legs and heads resembling spiky disco balls. I suppose that they could’ve been dangerous–perhaps–if one lacked the ability to slowly walk away from them. A gentle slope would’ve been a serious impediment to their motive power, and a strong headwind could stop a Quark invasion in its tracks. The Doctor Who comics of the ’60s attempted to build up the Quarks into major adversaries of the 2nd Doctor, and the episode’s writers got into a beef with the BBC about the presumed merchandising appeal of their creations. But aside from a brief cameo during the final episode of The War Games, they have yet to toddle their way onto our screens again. Tomorrow: the last of the Jagaroth!